Download Catalog #36 PDF: Click to download (requires Adobe Acrobat Reader). Printable in B&W or color! 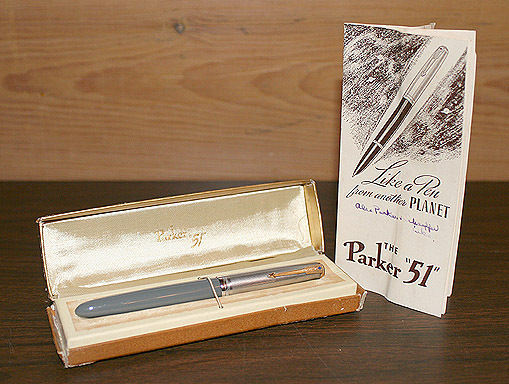 “Like a Pen From Another Planet!” This is how Parker introduced the Parker 51 in their 1940 Dealer Catalog. 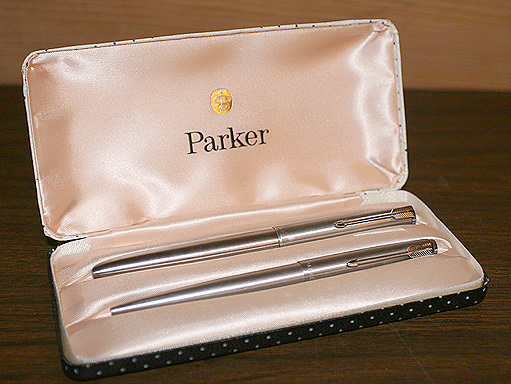 It goes on to say, “All the Parker Laboratories – engineering, chemical and metallurgical collaborated for 11 years to develop this history-making… pen.” Shaped like a jet plane without wings — and with a tubular nib never seen before! The 1941 version had a tassie on the bottom and aluminum jewels at both ends. Its “Speedline” filler was aluminum (first introduced in the Vacumatic several years earlier). 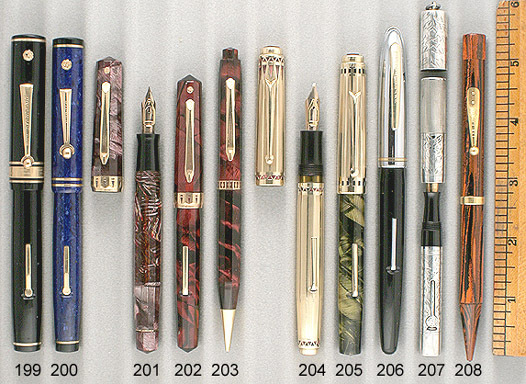 By 1942 only very few pens were produced with two jewels, and a pearl like jewel was used rather than aluminum. The metal filler was replaced with a plastic version. 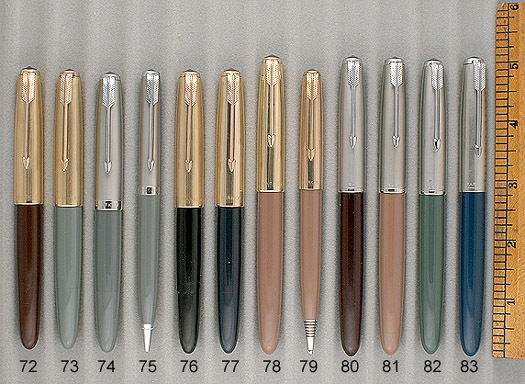 Some other major model highlights: In 1946 a button filling system was introduced, called the “Red Band,” reducing from 9 to 3 the number of times a user had to press to fill the pen. Unfortunately, it easily broke, and was quickly discontinued. They are now very rare. 1947 brought the “Demi 51,” a smaller version. 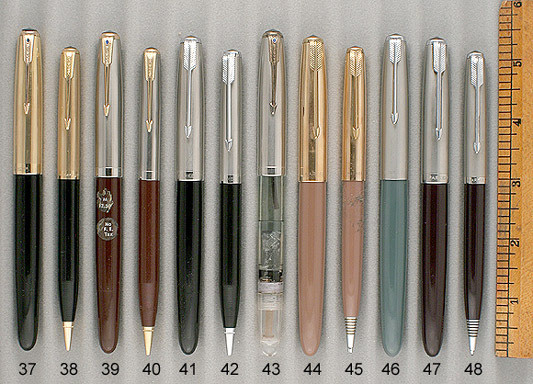 In 1948 the Vacumatic filling system was replaced with the Aerometric system and the Mark I 51 was born! A sac within a metal protector tube was fitted with a pressure bar which is pressed several times to fill the pen. With the Mark I the “Blue Diamond” clip was replaced with a plain arrow clip. While most 51s have a plastic body and metal cap (Gold, Sterling Silver, Gold Filled or Stainless Steel), all metal Mark Is were offered in Stainless Steel (Flighter), Gold-filled (Signet) and Solid Gold (Presidential). In 1950 the “51 Special” line was introduced with a non-gold nib (octanium — an eight metal alloy), polished cap and black cap jewel. 1958 brought the cartridge/converter filling 51, which failed in the marketplace and is quite rare today. 1969 saw the introduction of the Mark II 51, a major redesign. The 51 was now very much shaped like the 61, including a narrow clutch ring. On the Mark III, introduced in 1971 or 1972, the clip jewel is metal rather than plastic, the clutch ring widened, and a courser barrel thread is used. 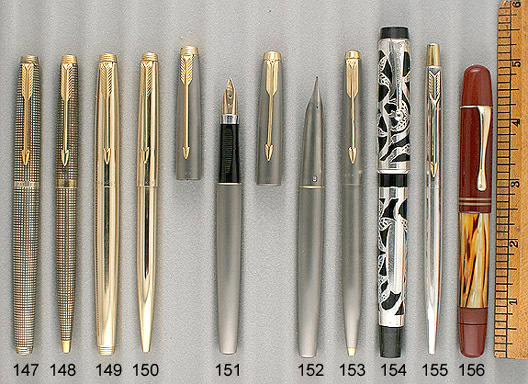 In 2002 the 51 “Special Edition” was introduced, double jeweled and sporting a sterling silver “Empire” cap, allowing new generations to enjoy the world’s best pen! 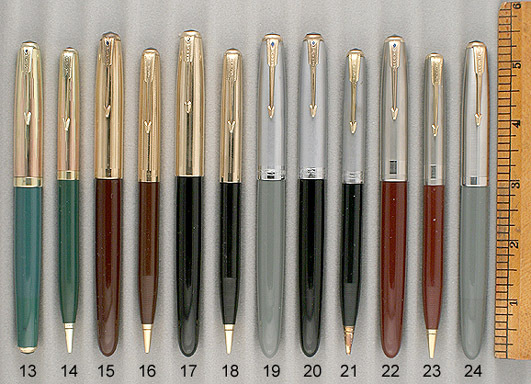 The 51 was officially discontinued in 1978, but it is known that production continued several more years in South America using actual Parker equipment. Perhaps over 20 million have been sold in total. Up until 1953 (1959 in Europe) 51s contain a date code stamped onto its barrel. 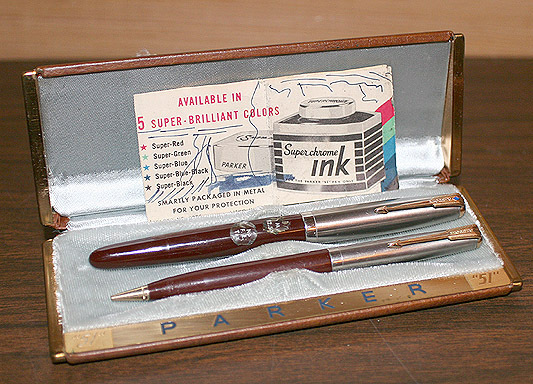 Matching Parker 51 pencils and ball pens were also produced. 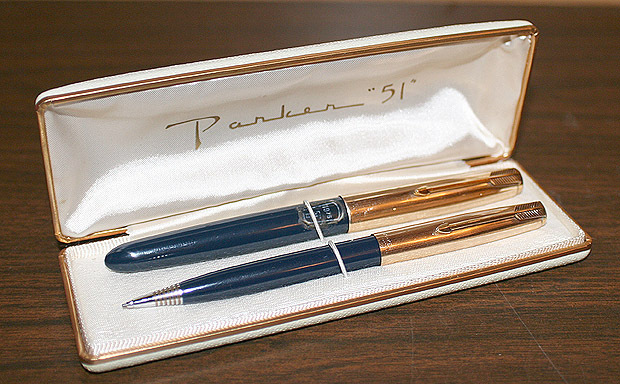 Please enjoy browsing the Catalog at our selection of Parker 51s — by far the most popular pen ever! 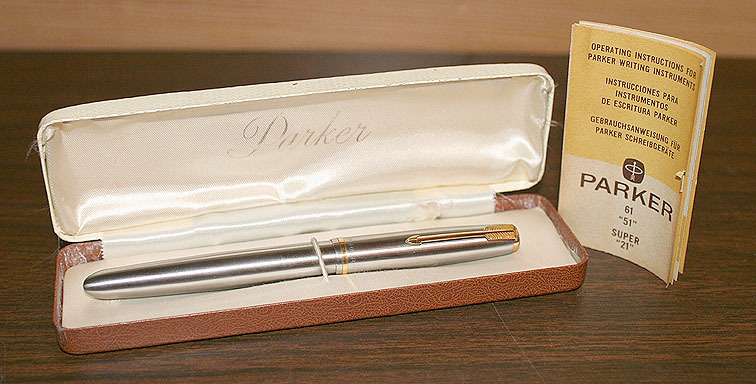 1943 Parker 51 Vac in Buckskin (Tan). 1/10 16K Gold-filled cap (alternating pinstripe and plain panels). Extra-smooth, medium nib. A few minor creases in the cap, otherwise near mint. 1945 Parker 51 Vac in Yellowstone (Mustard). 1/10 16K Gold-filled cap (fully pinstriped). Medium/fine nib. A few minor surface scratches on cap, otherwise near mint. 1945 Parker Twist activated pencil for above set. 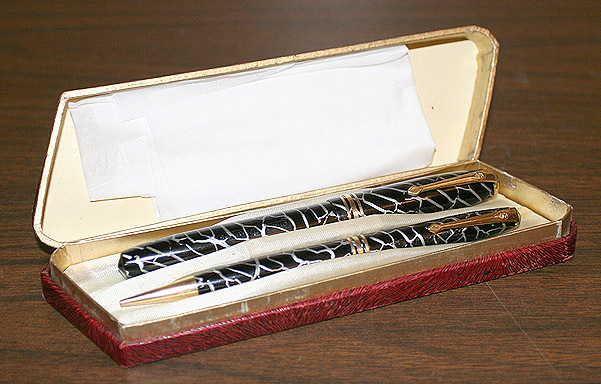 1946 Parker Twist activated pencil for above set. 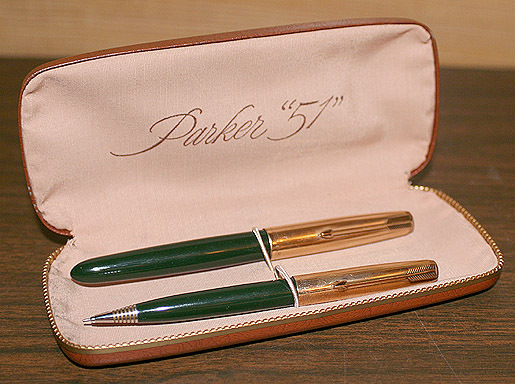 1948 Parker 51 Vac Set in Nassau Green. 14K “empire” caps. Medium nib. Click for close-up photo. Mint in unusual white presentation box. 1942 Parker 51 Vac Set in Burgundy. 1/10 14K Gold-filled caps (alternating Pinstripe & Scalloped Line pattern). Very hard to find 1942 model, with barrel imprint at top of cap rather than by open end. Click for close-up photo. Mint In original box. Fine nib. 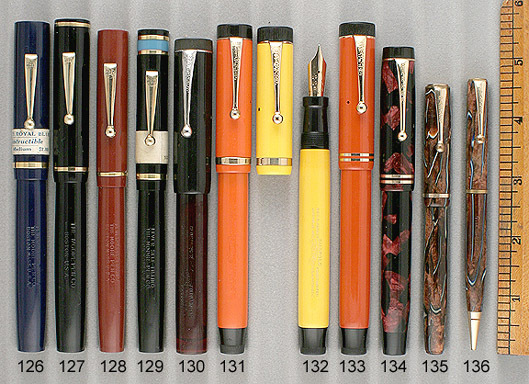 1942 Parker Twist-activated pencil for above set. 1942 Parker 51 Vac Set in Black. 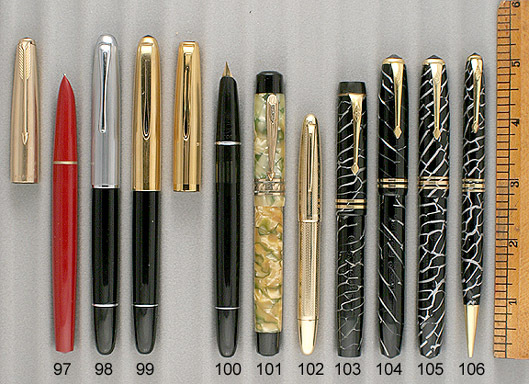 1/10 14K Gold-filled caps (alternating pinstripe and scalloped line pattern). Rare 1942 set. Fine point. Click for close-up photo. Mint in original box. 1943 Parker 51 Vac in Dove Grey. Fully pinstriped Sterling Silver Cap. Click for close-up photo. Mint in original box. Fine nib. 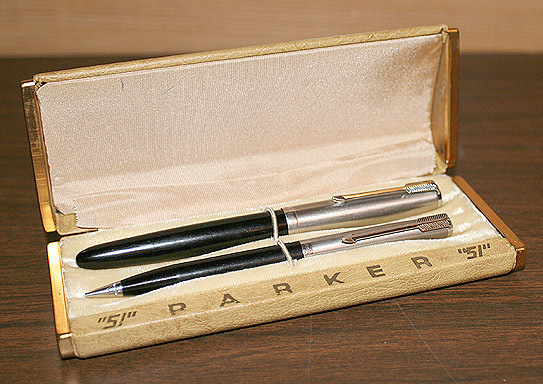 1944 Parker 51 Vac Set in Black. Pinstriped Sterling Silver caps. Click for close-up photo. Near mint, in original box. Extra-fine nib. 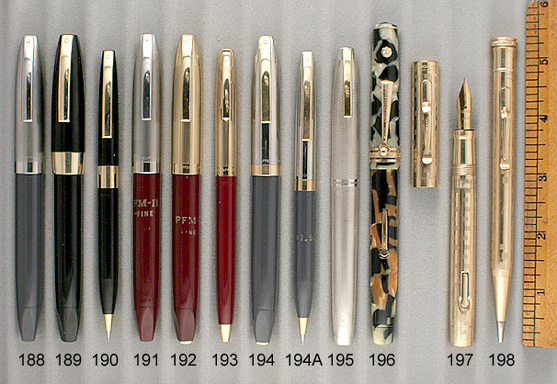 1944 Parker Twist-activated pencil for above set. 1944 Parker 51 Vac Set in Cordovan Brown. Brushed Lustraloy caps, with 1/4" wide raised horizontally chased bands (rare). Click for close-up photo. Near mint in original box. Medium/fine nib. 1946 Parker 51 Vac in Cedar Blue. 1/10 16K Gold-filled cap (fully pinstriped). Fine point. A few pin-point cap dings (reflected in price), otherwise near mint. 1946 Parker 51 Vac in Cedar Blue. 1/8 14K Gold-filled cap in the rare Heritage pattern (engraved rectangles). 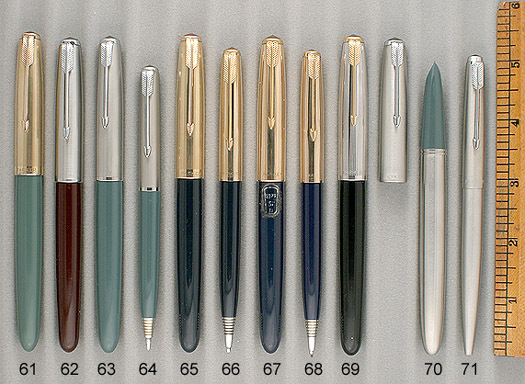 A user grade pen; cap has one dent below clip and a tad of band brassing, barrel shell has a tad of shrinkage. Medium nib. Excellent. 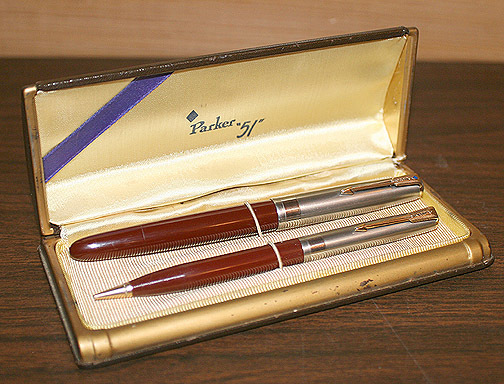 1947 Parker 51 Vac Set in Burgundy. Brushed Lustraloy caps. Click for close-up photo. In original box. Near mint. Medium nib. 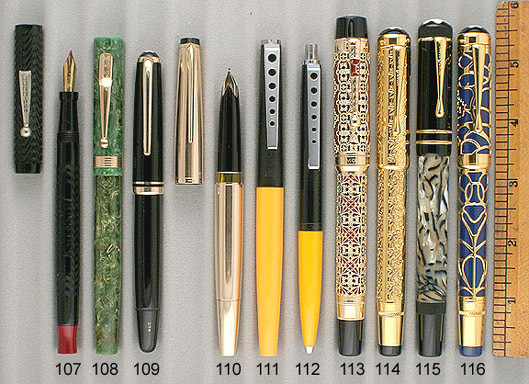 1947 Parker Twist-activated pencil for above set. 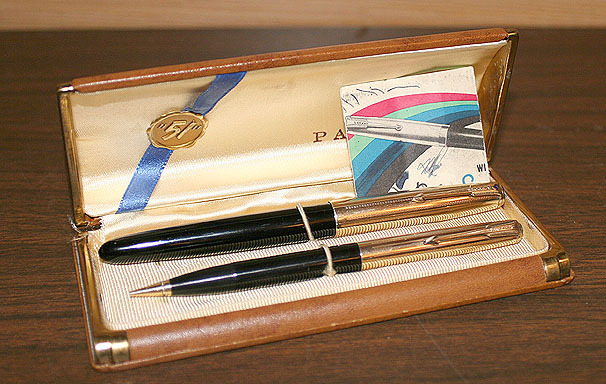 1948 Parker Twist activated pencil for above set. 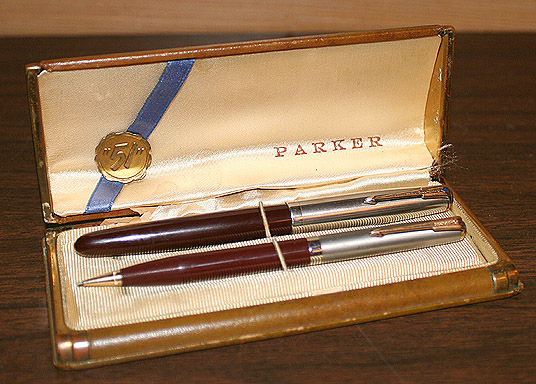 1947 Parker 51 Vac Set in Burgundy. Brushed Lustraloy caps. Click for close-up photo. Near mint in original box. Pen has original labels. Medium nib. 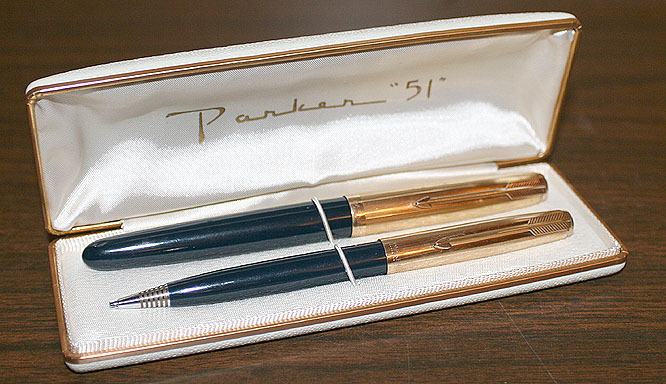 1948 Parker 51 Vac Set in Black. Brushed Lustraloy caps. Click for close-up photo. Near mint in original box. Fine nib. 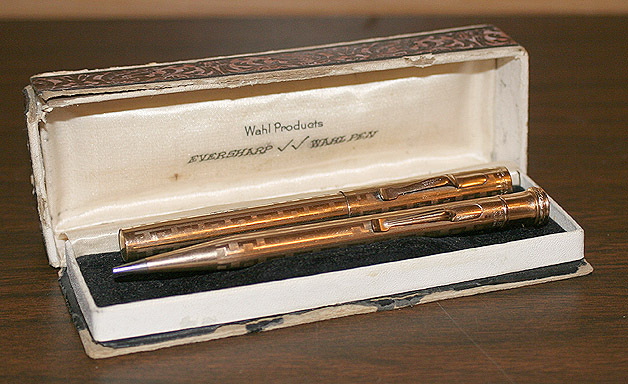 1948 Parker Twist-activated pencil for above set. 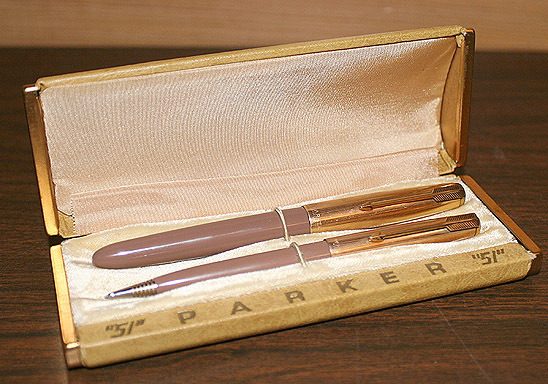 1949 Parker 51 Aero Set in Cocoa (tan). 1/10 12K Gold-filled caps (five converging lines). Click for close-up photo. New-old-stock, mint in original box, with original instructions and $29.75 price label). Fine nib. 1949 Parker Repeater pencil for above set. 1949 Parker 51 Aero Set in Plum (rare). Lustraloy caps. Extra-fine nib. Near mint. 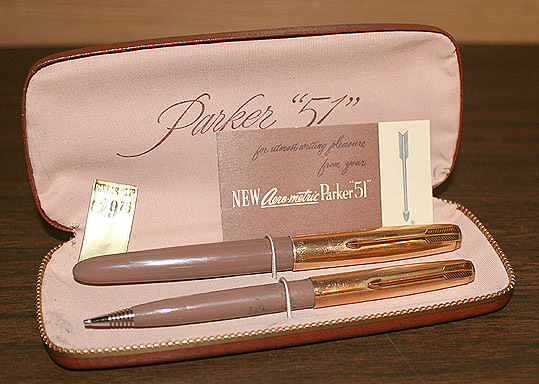 1949 Parker 51 Aero Set in Cocoa (Tan). 1/10 12K Gold-filled caps. Click for close-up photo. Mint in original box. Extra-smooth, fine nib. 1951 Parker 51 Aero Set in Burgundy. 1/10 12K Gold-filled caps (five converging lines). Click for close-up photo. New-old-stock, mint (dipped) in original box. Medium nib. 1951 Parker Repeater pencil for above set. 1952 Parker Repeater pencil for above set. 1952 Parker 51 Aero Set in Midnight Blue. 1/10 12K Gold-filled caps (five converging lines). Click for close-up photo. New-old-stock, mint (dipped) in original box. 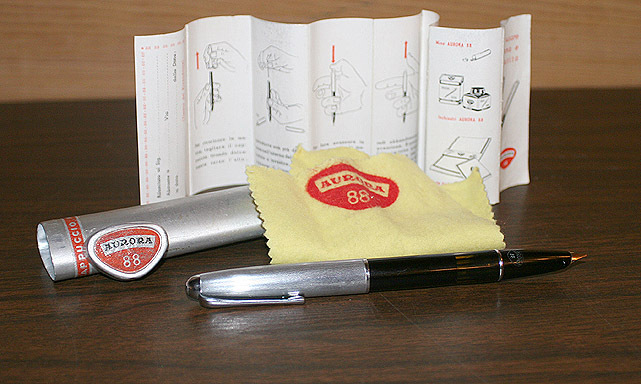 Pen with original label. Fine nib. 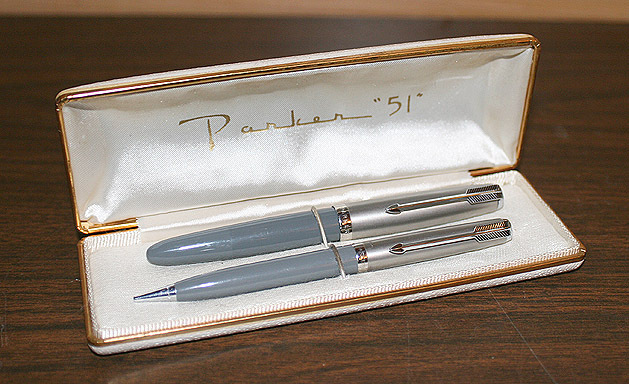 1958 Parker 51 Aero Flighter Set in Stainless Steel (Fountain Pen and cap activated Ball Pen) Rare Argintinean, bandless models. Click for close-up photo. Mint in original box. Medium/fine nib. Grey shell – other colors available, ask for what you would like. 1947 Parker 51 Demi Vac in Burgundy. 1/8 14K Gold-filled cap (fully pinstriped). Near mint. Fine nib. 1947 Parker 51 Demi Vac in Black. 1/8 14K Gold-filled cap (fully pinstriped). Medium nib. Near mint. 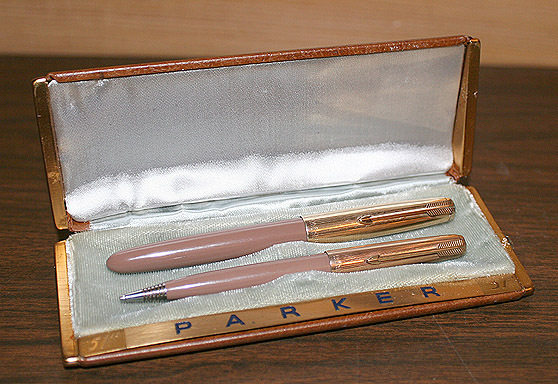 1948 Parker 51 Demi Aero Set in Cocoa (tan). 1/10 12K gold-filled caps (five converging lines). Click for close-up photo. Near mint in original box (a bit threadbare). Medium/fine nib. 1948 Parker Repeater pencil for above set. 1951 Parker 51 Demi Aero Set in Midnight Blue. Brushed Lustraloy caps. Click for close-up photo. New-old-stock, mint in original box. Pen and pencil both with original price labels. Fine nib. 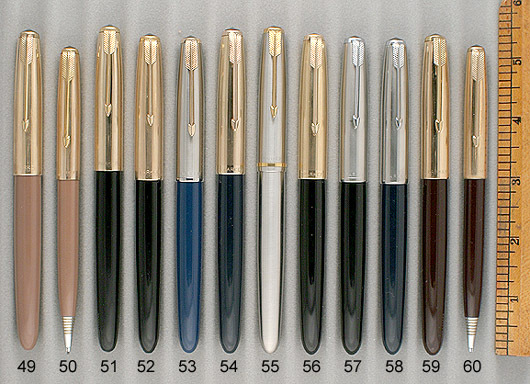 1951 Parker “Liquid Lead” for above set (refill dry). 1952 Parker 51 Demi Aero Set in Midnight Blue. Brushed Lustraloy caps. Click for close-up photo. 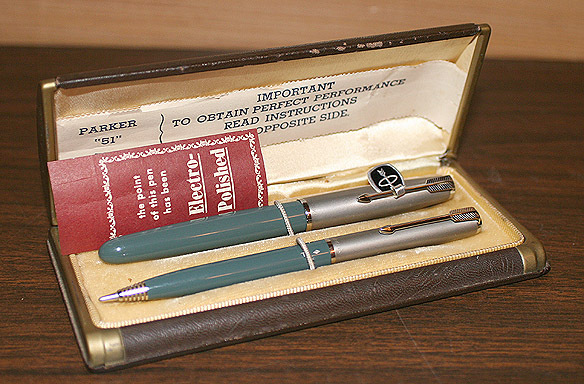 Mint in original box with “Electropolished Nib” insert. Both pen and pencil have original price labels. Medium nib. 1952 Parker 51 Demi Aero Set in Navy Grey (replaced Dove Grey). Brushed Lustraloy caps. Click for close-up photo. 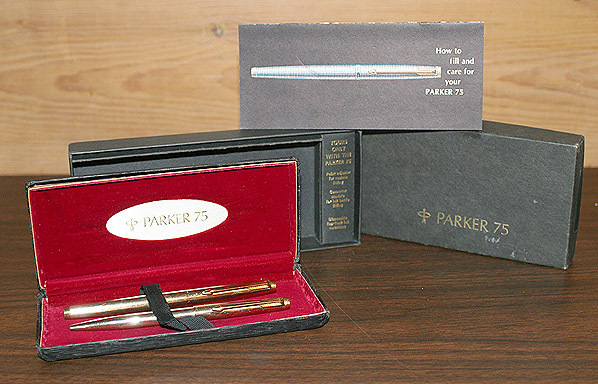 New-old-stock, mint in original box, with original instructions and “Electropolished Nib” insert. Pen with original $10.00 price label. Medium nib. 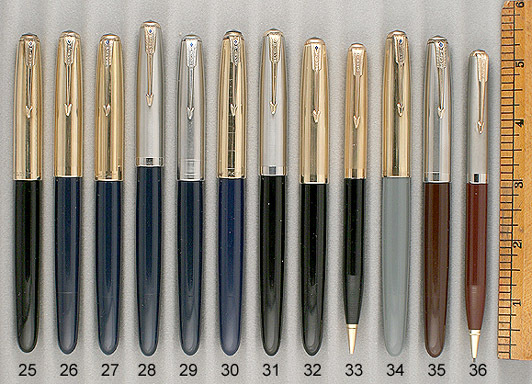 1952 Parker “Liquid Lead” for above set (refill dry). 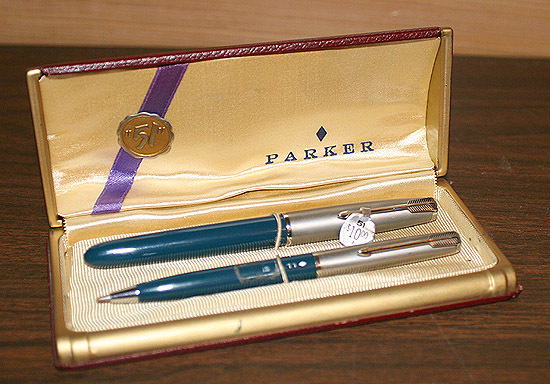 1969 Parker Ball Pen for above set. 1969 Parker 51 Mark III Aero in Rage Red (rare) (England). 1/10 12K Gold-filled cap (four converging pin stripe pattern). Extra-smooth, broad nib. Near mint. 1949 Aurora 88 PIF in Black. FIRST MODEL 88! Famous NIKARGENTA fully pinstriped cap, made of an alloy of Nickel and Silver. Visualated barrel window. Click for close-up photo. Mint-in-box with Instructions & polishing cloth. The box is a triangular shaped aluminum tube (a bit scuffed). 1975 Aurora 88 PIF in Black. Gold-filled pinstriped cap with forward slanting crown with black inset. Visualated barrel window.. Semi hooded nib. Medium/fine nib. Click for close-up photo. Mint in original box with outer sleeve. 1937 Camel #6 BF in Green & Ivory Pearl (much like the Duofold Sr. Green Moderne). GFT. Medium, flexible nib. A tad of brassing here and there, but a great pen and very hard to find! 1955 Conway Stewart 58 LF Set in Cracked Ice. GFT. Broad point. New-old-stock. Click for close-up photo. Mint in original box. 1955 Conway Stewart Pencil for above set. 1925 Mabie Todd 44 Eternal LF in Deep Jade. GFT. Minor ambering of the cap and barrel, along with clip ball and lever brassing. A user grade pen, with a very nice Medium nib. Excellent. 1956 Montblanc 84 PIF in Gold Filled. Alternating pinstripe and plain panels. Medium nib, with a tad of flexibility. Near mint. 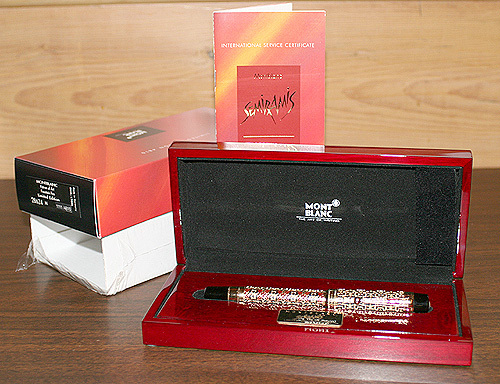 1994 Montblanc Semiramis Limited Edition 1111/4810. New-old-stock. Click for close-up photo. Mint in original box with outer box, outer sleeve, papers. 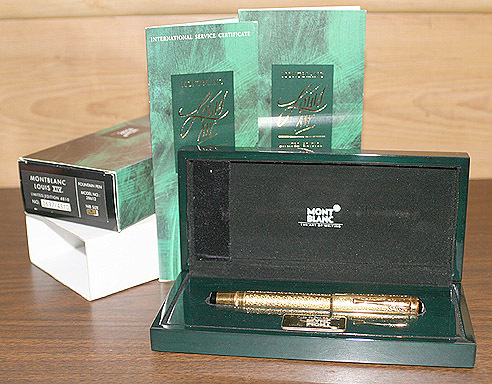 1994 Montblanc Louis IV Limited Edition 0697/4810. New-old-stock. Click for close-up photo. Mint in original box with outer box, outer sleeve, papers. 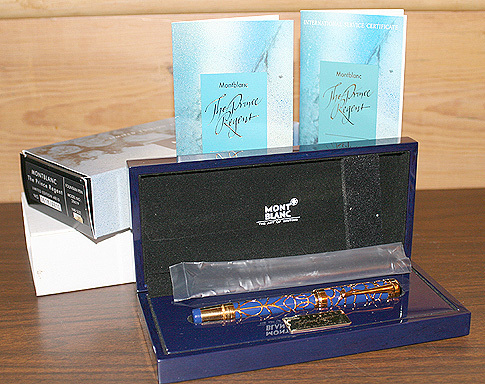 1994 Montblanc Prince Regent Limited Edition 0618/4810. New-old-stock. Click for close-up photo. Mint in original box with outer box, outer sleeve, papers. 1908 Moore 2.50/1 Safety in BCHR. Medium nib. New-old-stock. Mint with original label. 1908 Moores 5.60/48 Safety Filler in BCHR. GFT. Cap band engraved “R.G.P.Bugg.” Has the proper “American Fountain Pen” nib. 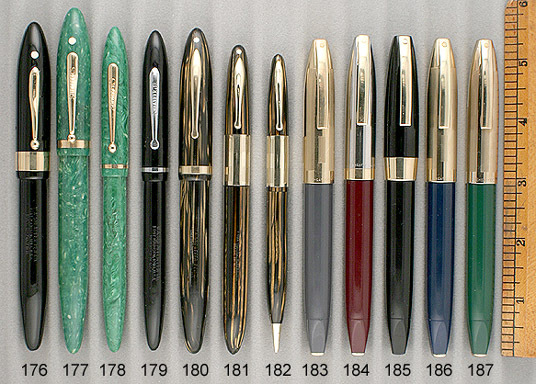 Extremely large example of the safety pen made famous by Moores. And for you calligraphers, it is fitted with an extra-fine, triple flexible calligraphy/copperplate nib! Bright crisp color and chasing. Near mint. 1925 Moore L-84 LF ring-top in Royal Blue. GFT. Medium/broad nib. New-old-stock, mint with original label. 1925 Moore L-96 LF in Royal Blue. GFT. Medium nib. New-old-stock. Mint with original label. 1925 Moore L-94 Luxor LF in Black. GFT. Beautiful design with wide light blue band inset between two G/F bands near the top of the cap! New-old-stock. Mint with original label. 1916 Parker #28 Jack Knife Safety in very rare Red Bakelite with BHR cap and correct early NP clip. Wonderful condition with crisp imprint. 1924 Parker Duofold Sr. “Big Red” BF in Red Hard Rubber. Much rarer than the later plastic models. This was the last in the series, with the smaller size imprint which transferred to the plastic pens. Fine point. 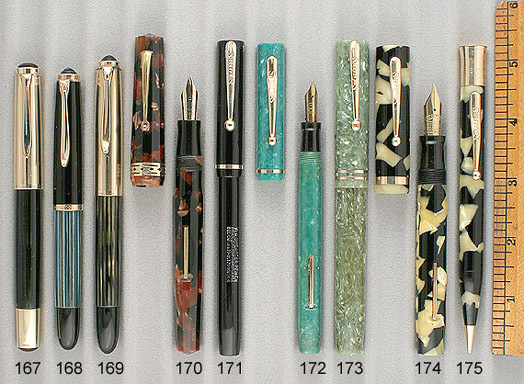 Pen is pretty mush new-old-stock. Mint except for a bit of shiny surface near where the cap covers the barrel. A great addition to anyone’s Duofold collection! 1928 Parker Duofold Sr. BF in Mandarin Yellow. GFT. Broad nib. New-old-stock with broad nib! Hint of color change on the part of the barrel which is under the cap (or the pen would have been $1750! ), otherwise mint. 1928 Parker Duofold Sr. BF “Big Red” in Cardinal. GFT. Medium nib. New-old-stock. Mint. Real hard to find in this condition! 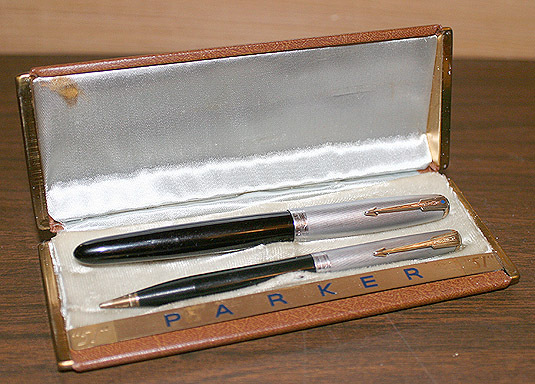 1932 Parker Pencil for above set. 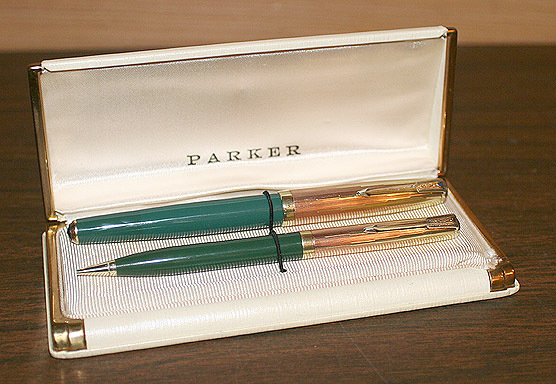 1937 Parker Vacumatic Sr. Maxima Set in Green Laminated. GFT. A beautiful set with matching striped jewels and section. Medium/fine nib. A tad of wear to the date code on the barrel (fully readable) otherwise near mint. 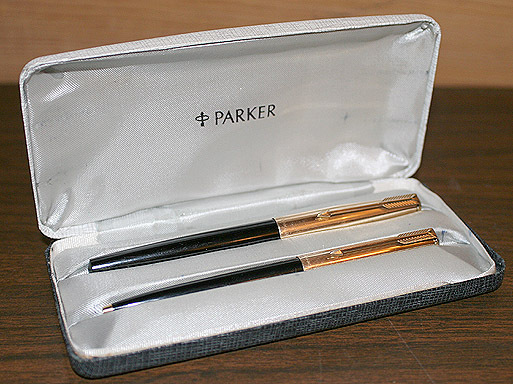 1937 Parker Pencil for above set. 1941 Parker Duofold Special BF in Blue Marble. A rare size in a rare color! Broad, flexible, italic nib (try to find this in a USA made Duofold!). Near mint. 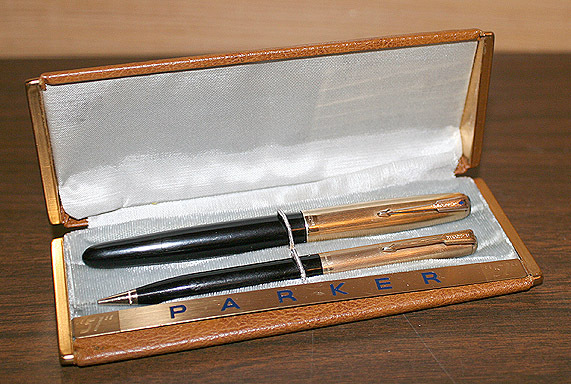 1946 Parker Pencil for above set. 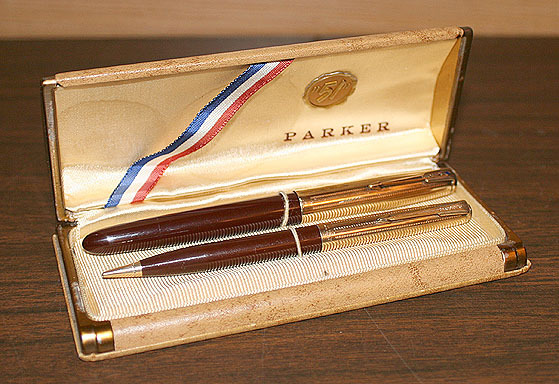 1970 Parker 75 Presidential Set in 14K Smooth Solid Gold! Cartridge/converter fill. New-old-stock. Click for close-up photo. Mint in original box with cartridges, converter, nib adjustment tool, instructions and outer box. A great find! 1953 Pelikan 100N PIF “Cobra.” Extremely rare. 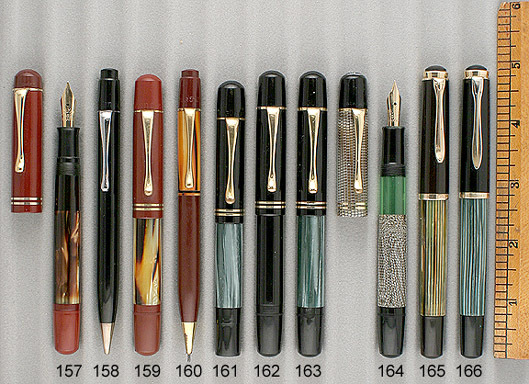 This version, with black turning knob and inner cap is correct and pictured in the Pelikan books. GFT Fine, flexible nib. New-old-stock. Absolutely mint! 1935 Radius “Superior” Doric LF in Red Pearl Marble. Radius was a Trademark of Cisea Co. in Turin, Italy. 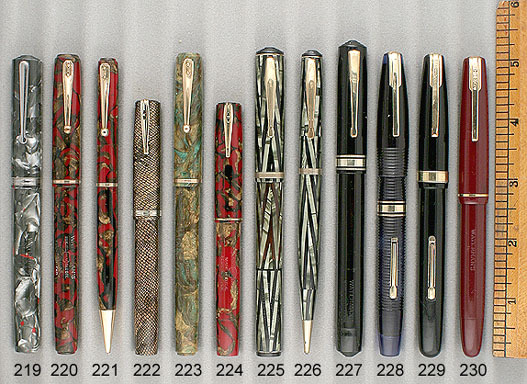 Turin housed many famous & lesser known pen makers. Oversize “Doric” look-alike. 18K Rolled-gold trim. 14K signed Radius broad, extra-flexible nib. Near mint, and beautiful! 1930 Sheaffer Lifetime Balance Oversize LF in Deep Jade. Pretty close to perfect color! GFT. Fine point. A speck of brassing on each side of the clip ball, otherwise near mint. 1937 Sheaffer Lifetime Balance Large LF in Brown Striped. GFT. Fine point. Some imprint wear (fully readable) otherwise near mint. 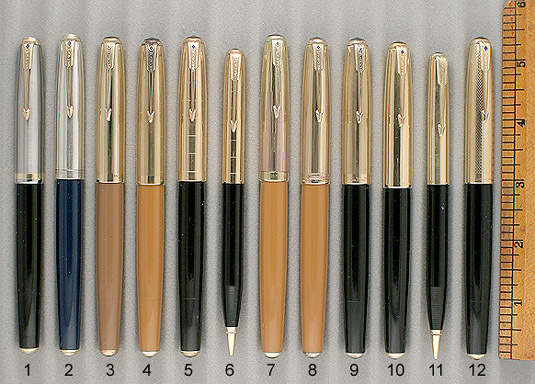 1942 Sheaffer Sheaffer Lifetime Triumph LF Set in Golden Striped. GFT. Somewhat rare to find as a lever filler (more common in plunger full). Large, extra-smooth, Triumph, wrap-a-round, medium nib. Near mint. 1942 Sheaffer Pencil for above set. 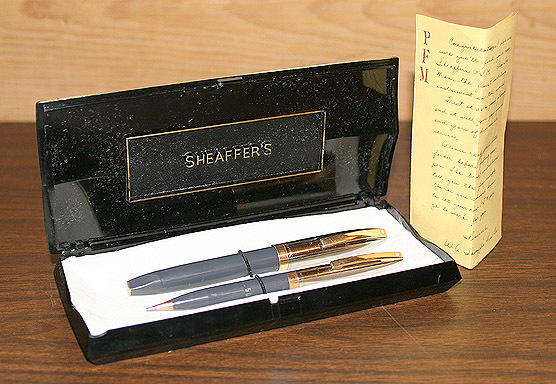 1959 Sheaffer PFM III Snorkel Fill Set in Black. GFT. Fine Point. New-old-stock. Click for close-up photo. Mint in box with original instructions. 1959 Sheaffer PFM II Snorkel Fill in Burgundy, with original barrel decal. Brushed Stainless Steel cap. New-old-stock. Click for close-up photo. Mint in box with original instructions and outer sleeve. Outer sleeve has a label in what is either Arabic or Hindi!?! 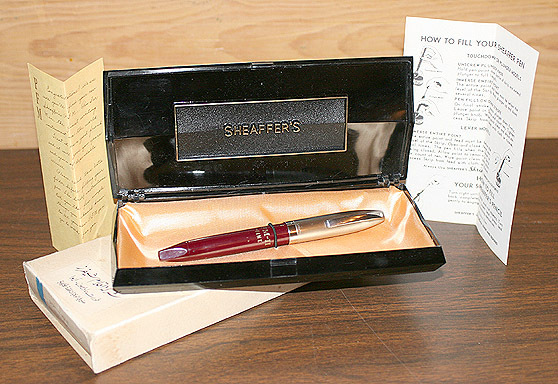 1959 Sheaffer PFM V Snorkel Fill Set in Burgundy with original barrel decal. Comes with ball pen, which is much rarer than the pencil! Gold-filled cap. New-old-stock. Click for close-up photo. Mint in box with outer box. Fine point. 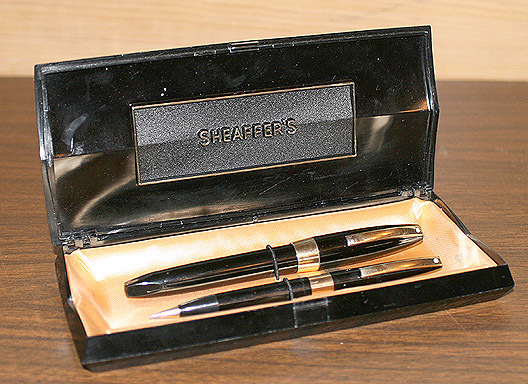 1959 Sheaffer Ball Pen for above set. 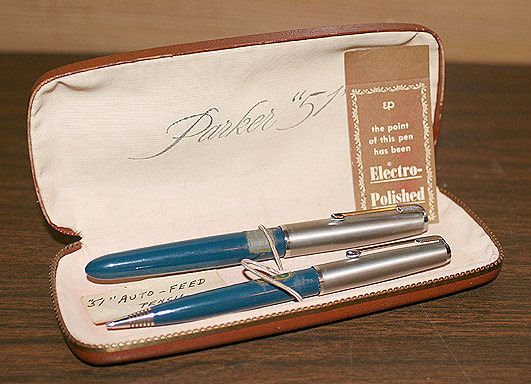 1959 Sheaffer PFM IV Snorkel Fill Set in Grey (rare). Polished Chrome cap with G/F band and clip. Fine nib. Click for close-up photo of set in original box. Pen near mint. Pencil mint. 1975 Sheaffer Imperial Model 676 cartridge/converter fill in Sterling Silver. Barley pattern. Gold-filled clip. Medium nib. New-old-stock, mint with original label. 1920 Wahl Eversharp #5 LF Set in Gold-filled. Greek Key Design. 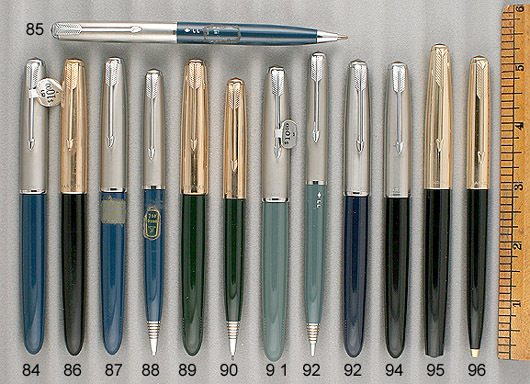 Five-size all-metal Wahl pens are rare, as is the larger-than-normal accompanying pencil! Medium, flexible nib. Pencil is mint. Pen has a tad of edge brassing. Indicia engraved in Old English Script: “M.C." Click for close-up photo. Excellent, in original box (a bit threadbare). Sale priced. 1920 Wahl Eversharp Pencil for above set. 1927 Wahl Eversharp Oversize Deco Band LF in Black. GFT. Near mint+ with crisp imprint and no brassing whatsoever. Fine, stiff (manifold) nib. 1935 Wahl Eversharp Repeater pencil for above set. 1936 Wahl Eversharp Coronet LF in Gold-filled pinstripe. Red Pyralin inserts. One of the most Art Deco pens produced! Highly sought after. A tad of brassing on the barrel where the cap posts. Indicia engraved. No dents or other damage. Visualated barrel window. STUB, ITALIC, ADJUSTABLE NIB! 1936 Wahl Eversharp Coronet LF in Green Pearl Web with Gold Filled pinstripe cap. Black Pyralin inserts. Beautiful! Pen has the famous “automatic ink shut-off valve” which operates when capped! Medium, extra-flexible, slightly italic nib. Near mint, with no dents, dings or brassing. 1915 Waterman #452 ½ LF in Sterling Silver. Beautiful Hand Engraved Vine pattern. 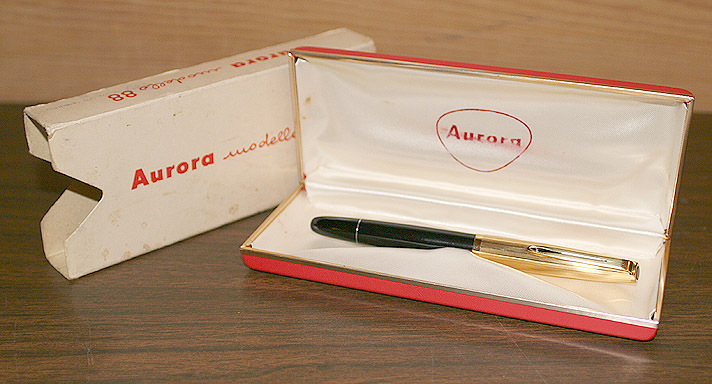 Rare version with “Telescoping Cap.” The entire pen slips out of the extra cap covering the top half of the normal cap. This allows a full length pen for the user, while the remaining part of the cap remains on the chain hanging around the neck, or on the watch chain! Quite innovative, and solved a real problem for the user at the time! Medium, flexible nib, slightly italic nib. A small split in the outer cap seam, otherwise near mint. 1927 Waterman #42 Continental Safety in 18K Rolled-Gold. Alternating panels of ‘cherries & pedals’ and engine-turned pinstripes with formed design. Cap with high relief rose floral crown and smooth clip. Near mint. 1928 Waterman #52V LF in BCHR. NPT. Medium, flexible nib. A tad of ambering of the rubber, otherwise near mint. 1928 Waterman #52V LF in Olive Ripple (rare). GFT. A tad of imprint wear (fully readable), otherwise near mint. Fine, flexible nib. 1935 Waterman Ink-View Deluxe Set in Emerald Ray. GFT. 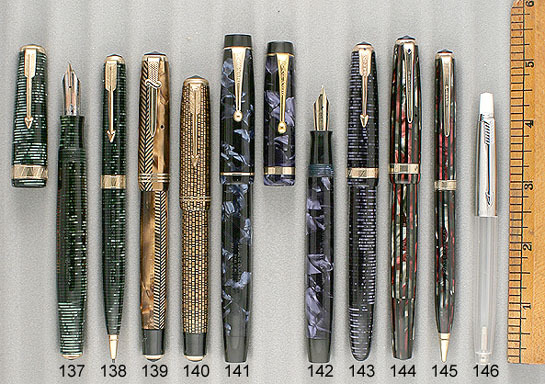 Wonderful, highly Art-Deco pen, designed to compete head-to-head with the Parker Vacumatic. Waterman “Keyhole” medium, flexible, italic nib. Near mint. 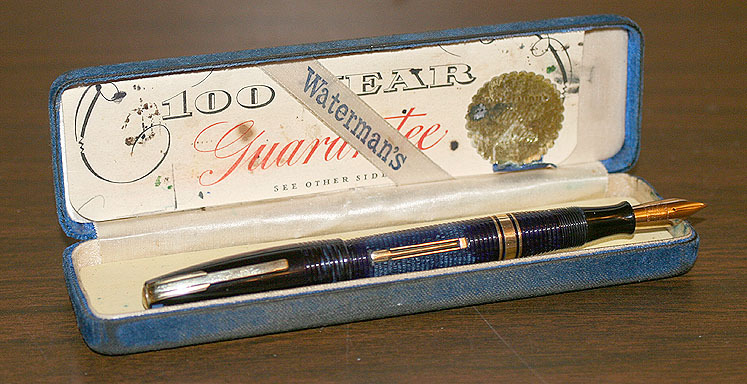 1940 Waterman 100 Year LF in Blue. GFT. "Ribbed" cap and barrel. Medium/broad, extra-flexible nib. A tad of imprint and wear from rolling around in original box for 65 years, otherwise near mint. Click for close-up photo in original box. 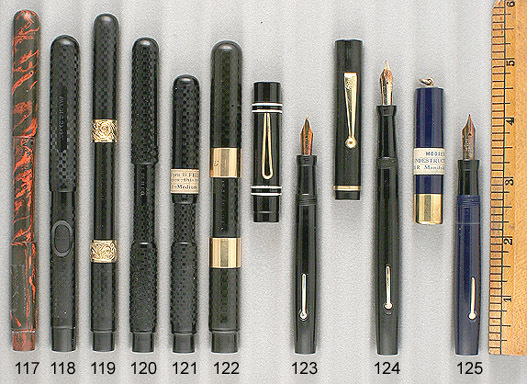 1942 Waterman 100 Year LF in Black. GFT. Medium, flexible nib. No, I won’t extend my one-year guarantee for an additional 99 years! A bit of lever brassing, otherwise near mint. 1945 Waterman #2 PISTON FILL in Burgundy. 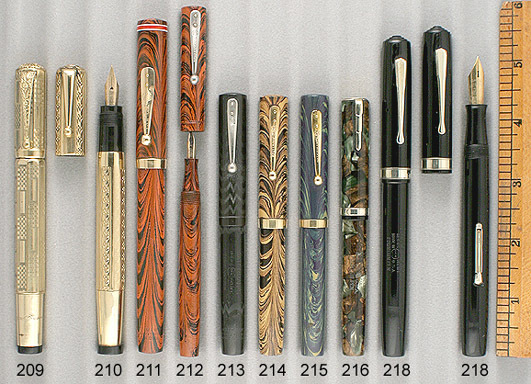 Waterman Piston Fill pens are extremely rare!! GFT. New-old-stock, mint. Medium nib.